Garmin has announced the latest entrant into its Forerunner range of multi-sports computers, the Forerunner 910XT. This sleek black box of tricks can measure speed/pace, distance, swim metrics, elevation and heart rate. 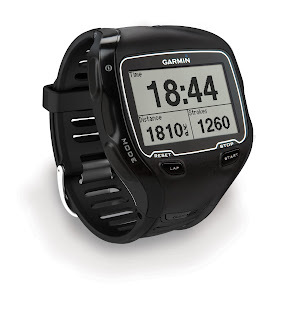 Building on the success of the Forerunner 310XT which has excellent facilities for runners and cyclists, the 910XT adds new features including a barometric altimeter for improved elevation data and a low profile that is wetsuit friendly – Garmin says users can easily slide wetsuits on and off over it. Swimmers will like this new computer’s ability to provide data for this key triathlon component. It can count strokes and calculate distance travelled, swim efficiency and swim pace. It computes a swimmer’s SWOLF score – the sum of the time for one length plus the number of strokes for that length. In open water it will track your route so it can be used in other water sports too. It is water resistant to 50 meters. Sophisticated cycling and running facilities are also included, and the Garmin Forerunner 910XT can be switched to a handlebar cradle for cycling use. It is ANT+ compatible and will sync with other compatible equipment. It has a 20 hour battery life. Add in the ever popular Garmin Connect online community, and the Garmin Forerunner 910XT looks like an all round athlete’s dream. The Garmin Forerunner 910XT will be available in November for £359 without a heart rate monitor and £389 with one. We will, of course, put it through its paces as soon as we can.